After suffering a severe back injury and recovering with laser therapy, he decided to dedicate himself to offering this amazing treatment modality to others. Creator of the Core 4 RRTT Recovery and Regeneration Program for maximum pain relief. A self treatment program whose sole purpose is to empower you to take back control of your life from chronic pain. He is a 1997 graduate from Palmer Chiropractic University and a master fitness trainer with over 25 years experience in the health industry. Suffering from obesity as a teenager and overcoming all of the emotional strife that accompanies being overweight, Dr. Perry dedicated himself to teaching others how to get in shape and lead a healthy lifestyle. He is currently publishing several books on health, fitness, laser therapy, business success, and self treatment programs from his website. Visit Dr. Perry today to get your unique Core 4 System Evaluation to determine why you are hurting, even after others have tried helping. 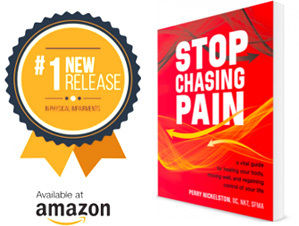 Hundreds have taken advantage of the Stop Chasing Pain program. Now it’s your turn!